We’ve all had to deal with a cracked windshield in our lives, and if you haven’t, you’re lucky. Any number of things can damage your windshield. Whether it’s a stone that pops up from the car in front of you and hits your window or debris coming off of the back of a truck, sustaining damage to your windshield is never welcomed. When your windshield cracks or chips, it can be frustrating. Sometimes it’s difficult to tell whether or not it can be repaired or if it requires a full replacement. Of course, we all hope that we can fix it, but there are some factors that you need to keep in mind when making these decisions. If you’re looking for windshield repair or replacement services in New Brighton, you can start by calling the pros at Auto Glass Fitters. In this article, we’re going to be focusing on chips and cracks as the two primary umbrellas that windshield damages fall under. There are many different specifications for damages that our windshield repair experts can discuss with you, but the damages generally fall under one or both of these categories. Generally, we like to repair chips or cracks that aren’t in the direct field of view of the driver. The materials we use to repair cracks give drivers 80%-95% of the original clarity and visibility that was on the undamaged windshield. For that reason, restoring a crack or dent that is directly in the view of the driver, especially if it is large, is not always feasible. If a crack is located anywhere that the driver doesn’t typically look while they’re driving, we can feel more comfortable repairing something that is a little bit larger in size. When we say size, we are talking about the length, width, and depth of your chip or crack. 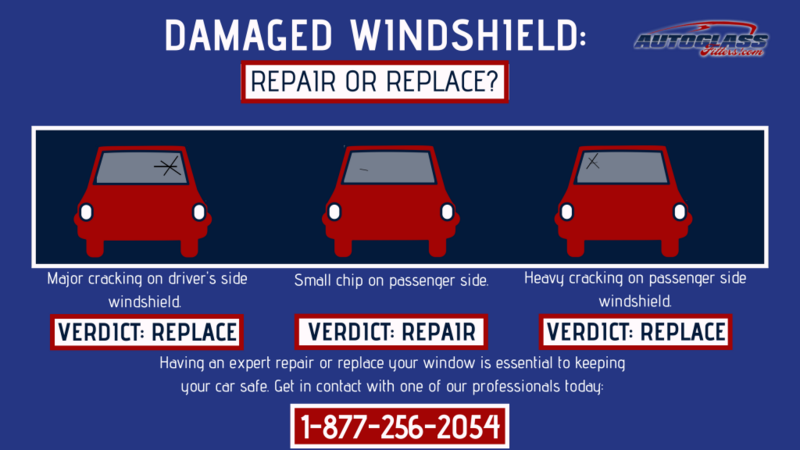 All of these factors are important and can affect whether or not you should attempt to repair or just flat-out replace your windshield. Chips can come in many forms. They can be deep divots or just small dents to the outer shell of your windshield. A general rule of thumb for chips or star breaks is that we can quickly repair them if they are smaller than a quarter in diameter, but we can still fix them with diameters up to three inches as long as they aren’t in the driver’s direct field of view. Otherwise, we will have to replace the windshield. We usually only repair cracks that have a maximum size of the length of a dollar bill. As we discussed earlier, location is a critical variable. We don’t want our repairs to distort the driver’s visibility, so we generally only repair maximum size cracks that are out of the driver’s field of view. If the break on your car is more substantial or in a bad place, we’ll have to replace the windshield for safety reasons. When you fill out our easy-to-use online quote machine, you can have a quote for your back windshield replacement or repair in New Brighton and nearby areas in minutes. Our mobile technicians will then come out and repair or replace your windshield based on damages. Call 1-877-256-2054 to speak to one of our agents today!